Berlin Restaurant Experiments With Virtual Currency At Room 77 in Kreuzberg, you can expect to pay 2 Bitcoin for a cheeseburger. 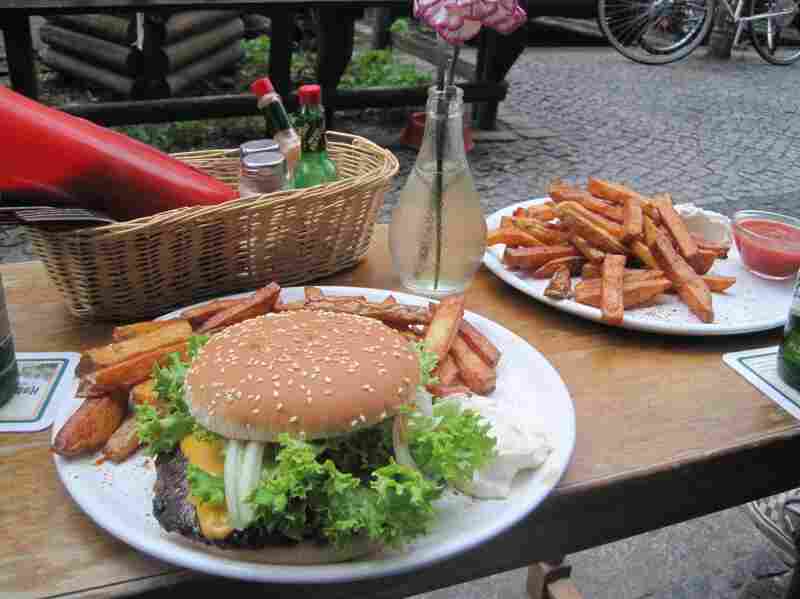 The Texas-inspired eatery is the only restaurant in Germany accepting the virtual currency. Using Bitcoin, the customer pays via a computer or smart phone. The Bitcoin is then sent encrypted to ensure it can't be hacked. Kreuzberg's Room 77 is a laid-back restaurant and bar that serves hearty burgers, burritos, and enchiladas. At Room 77, this cheeseburger will cost you 2 Bitcoin. That's about four Euro or five dollars. Though the owner, Joerg Platzer, spent time visiting the American Southwest and sampling the cuisine, he says he ended up relying on an American for true authenticity on his menu. "The Texan influence comes from my founding partner, who was a farmer boy," Platzer says. "He is from Paris, Texas, and whose grandparents have actually cooked for real cowboys on real wagon trains bringing cattle from point A to B." Room 77 has an air of nostalgia; American oldies play over the sound system and Platzer supports the traditional concept of "Sospenso." "You are having a good day," he explains. "You have money. You go somewhere to spend your money, and because you are having a good day, you pay an extra espresso, or an extra shot. And if someone comes along who had a bad day, who has no money, the place can still offer that person a coffee or a shot tequila." Room 77 is mainly furnished with well-used sofas, vintage chairs and tables, but the restaurant does show some signs of the digital age. "We accept Bitcoin" reads a paper note at the bar. Room 77 is the only restaurant in Germany that accepts the virtual currency. Bitcoin is also the name of the open source software developed for the currency. It was created in 2009 by Satoshi Nakamoto. "I would think there is actually a group of people behind the synonym. The idea is very powerful and mighty. The software is also very brilliant. So it's very unlikely that just one person threw it all together." When someone pays with by Bitcoin, either through a computer or smart phone, the Bitcoin is sent encrypted to ensure it can't be hacked. There are no transaction fees, and you can exchange a Bitcoin for real currency. "A Bitcoin- the exchange rate is actually four Euro or five dollars for one Bitcoin, so a cheeseburger would be two Bitcoin here." Most customers at Room 77 still pay cash. And while some critics call the digital currency a scam, the 45 year-old restaurant owner with a fondness for the wild west, both old and new, believes that the future of the alternative currency is still uncertain. "In the Bitcoin community, we actually estimate to take this decade to find its place everywhere in society."